The Boutique-Friperie L’Actuel constitutes the social economy component of the Centre d’action bénévole L’Actuel. Approximately 70% of donations of clothing and items received are sold by the thrift shop and are used to finance services to people in the need offered by the organization such as food assistance, infant assistance, help for children, community kitchens and activities for families. The Boutique-Friperie is open to everyone. Customers can, of course, save money, but this is an environmentally-friendly way to shop, which is very trendy. Nearly fifty volunteers are involved in the thrift shop’s operations. Note that in addition to representing 30% of the organization’s revenues, the Boutique-Friperie allows L’Actuel to provide free clothing assistance people in need. For example, in 2017-2018, the organization provided clothing assistance to 178 individuals. The Thrift shop regularly offers discounts on certain items, depending on arrivals and the time of the year. Monday to Wednesday, 9:30 a.m. to 5:30 p.m.
Thursday and Friday, 9:30 a.m. to 7 p.m.
A non-profit organization, L’Actuel is a volunteer centre whose services are based on mutual aid and volunteer work. 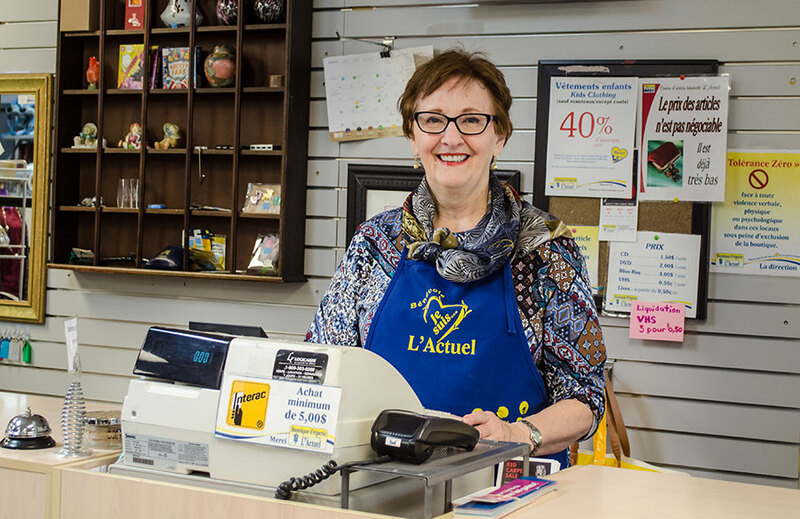 For more than 35 years, L’Actuel has played a vital role in its community by helping people in need, families, seniors, chronically ill, convalescent or disabled people, as well as organizations in Vaudreuil-Soulanges.